What if you could either add an extra hour to your day, or do what you usually would, but have an hour left over? How would you like to know ways to stop getting stalled by the 7 biggest time wasters? Would you like to learn a prioritization strategy that guarantees you or your people are always working on the most important tasks? Applying these proven strategies, you can now manage more effec… tively, and have greater control over yourself as well. 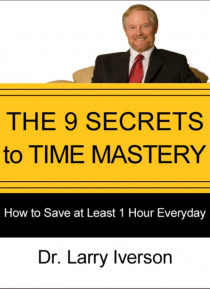 Begin using Dr. Iverson's time mastery strategies and gain that extra hour, starting today! *Learn the 4 keys to getting organized *Learn the #1 method for prioritization that takes less than 5 minutes to complete *Know how to apply 8 strategies for getting your work done faster and easier *Learn the 4 reasons why people procrastinate, and how to break the habit now *Learn a simple technique for dealing with email, texts and the telephone that will save you hours every week.